Parengarenga Forest, adjacent to 90 mile beach, was planted by the New Zealand Forest Service on Maori land leased from the Parengarenga Incorporation. The lease was signed in 1966 and had a term of 99 years but in 1999 a variation to the lease was negotiated between the Crown and the Incorporation and the term was reduced to the term of harvesting the first rotation and replanting of the second crop. When the neighbouring Aupouri Forest was sold to Juken Nissho in 1990 the Parengarenga Forest remained with the Crown and with the demise of the Forest Service the management of this forest was put out to tender. At this time PF Olsen was awarded the Forest Management Contract to manage the 5,000 stocked hectares of Parengarenga Forest. 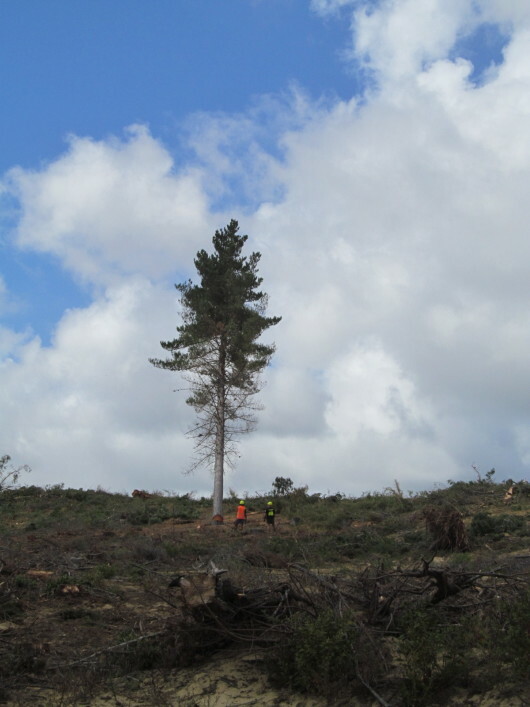 PF Olsen commenced harvesting the forest in 1997 and in agreement with Crown Forestry and the Incorporation appointed Adams Logging Limited as the prime contractor to harvest the forest. In what is a rather a unique situation Adams Logging felled the first tree in 1997 and, in March 2015, some 18 years later, felled the last tree having harvested from one end of the forest to the other. Adams Logging felled Parengarenga Forest's first tree in 1997 and its last tree in 2015, marking 18 years of continuous harvesting service. At the time of planting of the first rotation by the Forest Service it was widely considered that the forest would be uneconomic and the main objective of the forest was to stabilise the sand dunes and provide employment in the Far North. This was because of the location being a long way from markets and the infertile sandy soils which meant longer rotations and smaller inferior quality trees. This has proved to be far from the truth as the site has ensured the wood quality (density, stiffness, strength) of the trees is excellent and highly sought after by domestic processors. Also the undulating sandy soils has meant harvesting all year round with mechanical harvesters with high productivity and lower costs of harvest compared with harvesting on Northland clays of similar topography. Re-establishment of the forest started a year after harvesting in 1998 and the forest was re-planted in high GF containerised treestocks from PF Olsen's Nursery in Waiuku. These containerised treestocks were a perfect match for this site with its wind swept infertile sandy soils and has ensured excellent survival and fast initial growth rates. Every three years the re-planted second rotation crop was handed back to the Incorporation where PF Olsen continued to manage the crop on behalf of the Incorporation. On Thursday March 6th a celebration was held at the Potahi Marae in Te Kao to mark the end of the harvesting and the final Deed of Surrender which completes the process of handing back the replanted productive land to the Parengarenga Incorporation. This included a Powhiri at the Marae followed by a bus trip to the forest by 100 people to watch the last five trees being felled and processed into logs. The first four by an excavator and felling head and the last by Mark Nathan, an Adams crew member and an owner in the Parengarenga land. 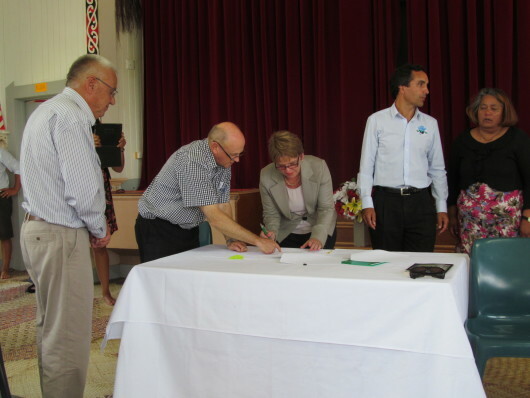 Invited guests included Minister Goodhue who signed the final Deed of Surrender on behalf of the Crown, MPI and Crown Forestry staff including Warwick Foran the General Manager Crown Forestry and Charles Schell the previous General Manager who re-negotiated the lease, PF Olsen past and present staff and the Chairman and Trustees of the Parengarenga Incorporation. Government, Crown Forestry and Parengarenga Incorporation sign the Deed of Surrender heralding a new period of ownership of the forest. Parengarenga Incorporation now has 10 years to wait before it can harvest the second rotation in its own right. PF Olsen is proud of the contribution it has made to this project and wish the Incorporation well for the future of this valuable forest estate.